A tour bus caught fire on northbound Interstate Highway 880 in San Jose late Tuesday, according to the California Highway Patrol, and luckily no one was injured. It's still unclear why the Medina Tours bus, based in San Jose, caught on fire about 9:40 p.m. near Gish Road, according to CHP Officer Tom Byington. He said the quick-thinking driver got the passengers off the bus. 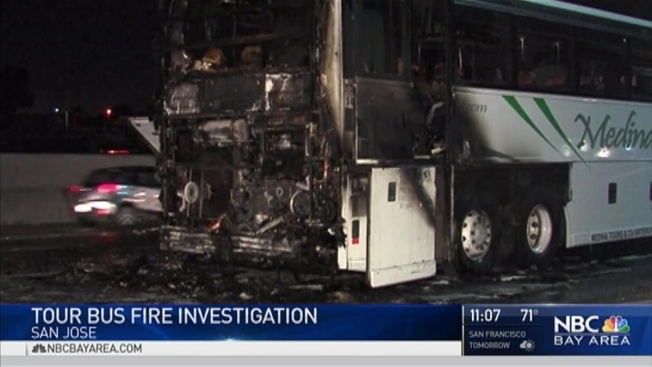 The driver, who gave his name only as Fernando, spoke to NBC Bay Area off camera, explaining that he saw sparks on his side of the bus, and was able to get 16 passengers off just before the fire erupted. The company provided a second bus to re-route those on board. A Sig-alert was issued for all northbound lanes around 10 p.m.